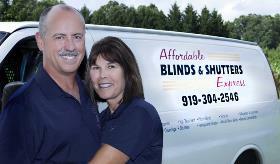 Adding motorized blinds, shades, or draperies to your home or business can be a great option for many reasons. First, they make hard to reach areas instantly accessible by the click of a button. If you have high windows, have a hard time getting around, or are simply don’t want to stretch around that piece of furniture, getting motorized shades makes life a whole lot easier. Motorized shades also allow you to easily control the amount of light that enters a room. Whether you want to add a little romance to the atmosphere or need black out shades for your home cinema, motorization is the perfect solution. Plus the cordless feature means that it is safer for both children and pets. Almost anything from blinds to awning can be motorized, so visit us to find the right fit for your home.